Kidzworld reviews the magical Disney film The Jungle Book. Is it a treat to revisit a new version of human cub Mowgli and his animal pals? We think so. 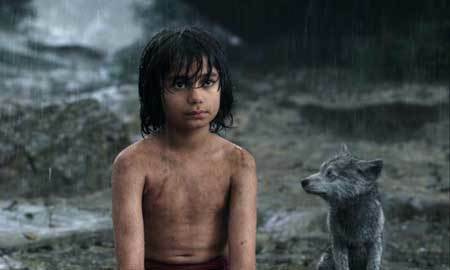 In The Jungle Book, “man cub” Mowgli (Neel Sethi) loves the wolf family who raised him but is frustrated in that every time he creates something clever to solve a problem, i.e. he builds something or creates a tool, he is accused of creating “tricks”, a human trait that his animal pals strongly discourage. Will one of his “tricks” ever impress or aid them? Mowgli, a young “man cub” has been raised by wolf couple Raksha (voice of Lupita Nyong’o) and Akela (Giancarlo Esposito) since babyhood when he was brought to them by black panther Bagheera (Sir Ben Kingsley). He is expected to behave like a wolf and is put down when he solves problems by using human tricks like creating tools. He must learn the ways of the pack. During a severe drought, all the animals in the jungle gather at a huge rock surrounded by the only remaining water. A “Water Truce” is in effect so nobody is eating anybody. 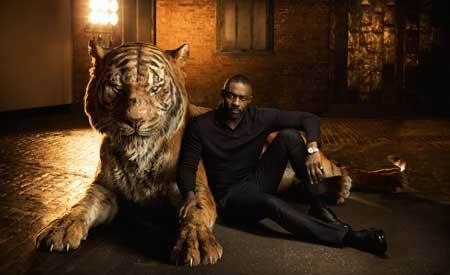 Huge and scary Bengal tiger Shere Khan (Idris Elba) comes to the rock and smells Mowgli. Man is not welcomed in the jungle. The tiger’s face was burned by a human’s torch and he hates all men. 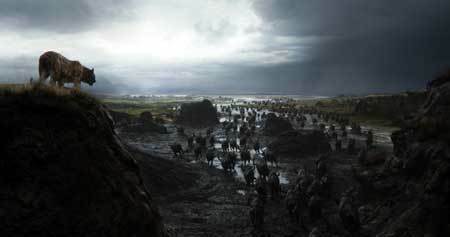 When the Water Truce ends they must give him the man cub or many will die. Mowgli volunteers to leave on his own. Bagheera will guide him to the human village. 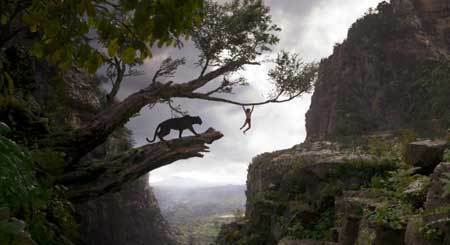 Shere Khan jumps the duo on their way and Mowgli escapes alone. 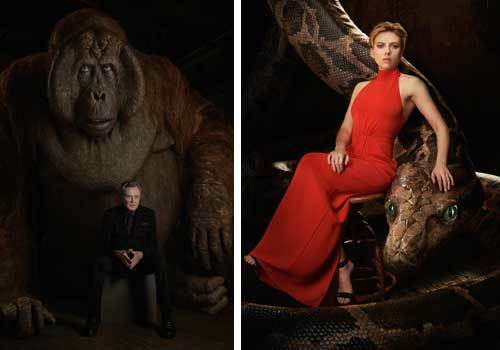 Deep in the jungle he meets giant python Kaa (Scarlett Johansson) who knows that the boy’s father was killed by the tiger and he was an infant alone when found by Bagheera. Kaa shows Mowgli a vision explaining fire, Man’s “red flower” and its beauty and terrible destructive powers. 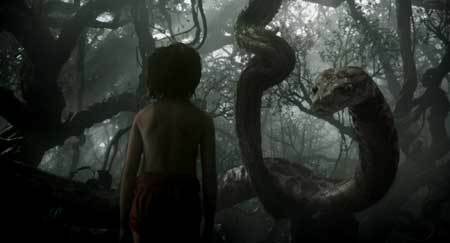 Kaa is about to crush and eat Mowgli when he is rescued by huge bear Baloo (Bill Murray). 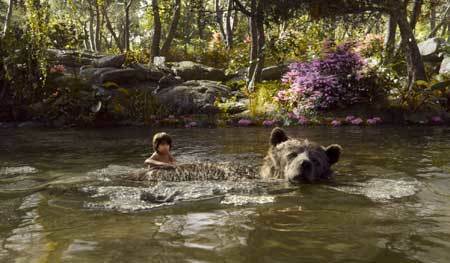 In return for saving his life, Baloo makes Mowgli fetch him honey from honeycombs perched high on a cliff. Mowgli uses human inventive ingenuity to get the honey and bear and boy form a friendship. Mowgli will leave when winter arrives. Shere Khan is furious that the wolf pack has let Mowgli leave and takes an awful toll on them. He demands that the boy be turned over to him when Mowgli returns. Bagheera, looking for Mowgli, finds him with Baloo and is a bit sad on learning the boy wants to stay with the bear. 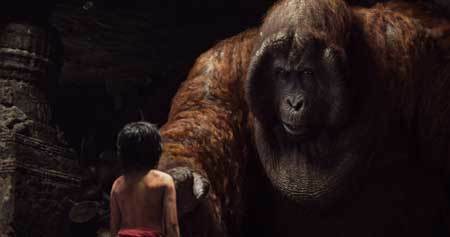 After Mowgli saves a baby elephant from a deep pit, again using human “tricks”, the elephants trust him but the boy is grabbed by a group of monkeys who take him to their leader King Louie (Christopher Walken), a ginormous orangutan who is sure Mowgli, being human, knows how to make fire. To him fire is power. Bagheera and Baloo cooperate to rescue Mowgli and Louie is killed in the process but Mowgli is angry when he learns of what Shere Khan has done to the wolf pack. His friends knew and didn’t tell him. 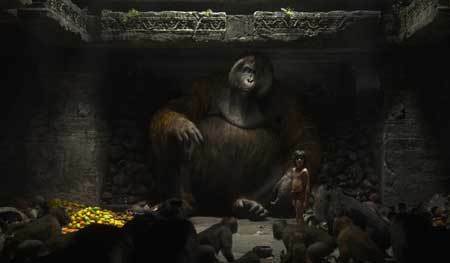 Mowgli goes off to the human village alone and steals a lit torch. On the way back to the deep jungle to confront Shere Khan, he accidentally sets a huge fire. Will Mowgli confront the tiger? Will the animals help him? Will the fire be put out? Will his animal friends ever accept the fact that Mowgli is a human boy? This new version of The Jungle Book is beautiful to look at. 3-D only adds to the experience rather than being a dark detraction. CGI animals are extremely believable and “real”. 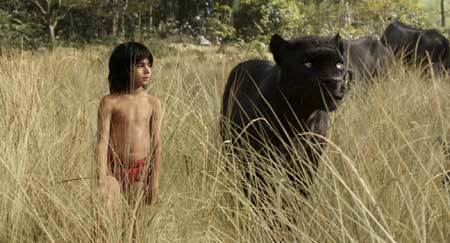 Newcomer Neel Sethi Is charming as Mowgli with only a few “stiff” line readings. Real voice actor stand-outs are Bill Murray as the funny, charming Baloo the bear and Idris Elba as the frightening yet pathetic wounded tiger Shere Khan. The story reminds us a bit of The Lion King in its animal characters who gather near a big rock and have to beware of a disfigured feline “baddie”. The story slows down a bit too much in a few places but things perk up with two songs, “The Bare Necessities” and “I Wanna Be Like You” that are preserved from the early Disney animated film and they will make you smile in this version. Also hang out during the end credits for “Trust in Me” sung by Scarlett Johansson who pays seductive snake Kaa and an adorable CGI animation in which all the animals appear inside the pages of Kipling’s original novel to interact in charming ways. The usual Disney themes of cooperation and pride in being yourself etc. are obvious but not laid on too thickly. 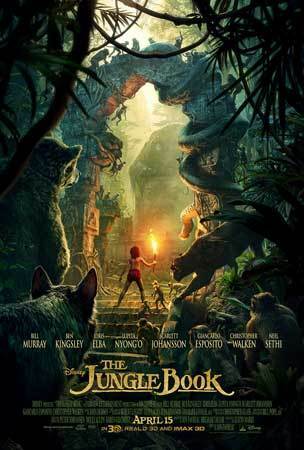 Whether you are a fan of the early animated film or the novel or not, you can really get into the tale of Mowgli and his jungle pals, all of which will carve a special place in your heart We go four stars. The Jungle Book is in theaters now! Do you wish animals could talk and become your best buds? Are you into experiencing new adventures either solo or with pals? Tell us how you feel below with a comment. Who is your favorite character from The Jungle Book?